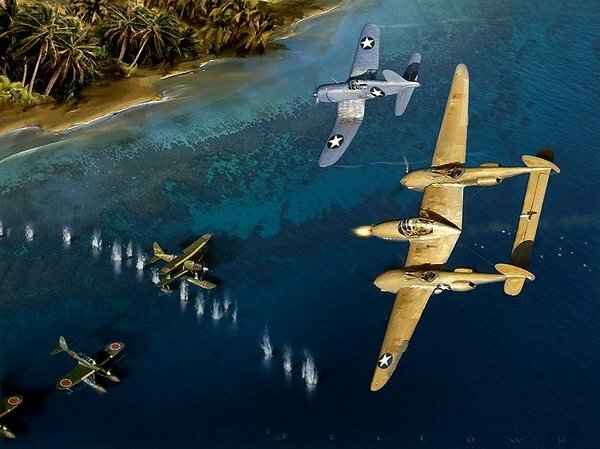 L/E of 199 Giclee Prints S/N by the Artist Image Size: 17.5" x 14" Paper Size: 23.5" x 20"
Elements of the assemblage of Allied aircraft that sortied from Guadalcanal during the war are seen here in a cooperative effort to eradicate a nocturnal pest known as "Louie the Louse". Such aircraft, whether US Navy USMC, or USAAF were referred to collectively as the Cactus Air Force, particularly during the period between August and December of 1942. Here, we see a P-38 flown by 13th USAAF Lt. Rex T. Barber, 347th Fighter Group, 339th Fighter Squadron and an F-4U-1 Corsair flown by USMC pilot, Lt. Eben "Ben" Dale, VMF-124, as they attack a group of Japanese Navy floatplanes at anchor in the Faisi-Poporang seaplane anchorage located in the Shortland Island Group, Northern Solomons. The targets of this March 29, 1943 early-morning raid had been launching night-harassment missions to the Henderson Field area of Guadalcanal (Allied code name: CACTUS) on a nightly basis, keeping the Allied personnel assigned to the Island awake, and thus degrading their combat effectiveness. Although the raid was a success with no losses, Barber was fortunate to return, having lost three feet of his left wingtip on the radio antenna mast of a Japanese Navy destroyer-escorttype patrol craft which he had subsequently strafed on the return flight to CACTUS. After April, 1943 the Cactus Air Force was referred to as AirSols.